Indianapolis Indian Community | | Where do you live? As the brief spring warms the landscape, northern India cuts loose for a day of hijinx and general hilarity. The festival of Holi is celebrated on the day after the full moon in early March every year. Originally a festival to celebrate good harvests and fertility of the land, Holi is now a symbolic commemmoration of a legend from Hindu Mythology. The story centres around an arrogant king who resents his son Prahlada worshipping Lord Vishnu. He attempts to kill his son but fails each time. Finally, the king's sister Holika who is said to be immune to burning, sits with the boy in a huge fire. However, the prince Prahlada emerges unscathed, while his aunt burns to death. Holi commemorates this event from mythology, and huge bonfires are burnt on the eve of Holi as its symbolic representation. This exuberant festival is also associated with the immortal love of Krishna and Radha, and hence, Holi is spread over 16 days in Vrindavan as well as Mathura - the two cities with which Lord Krishna shared a deep affiliation. Apart from the usual fun with coloured powder and water, Holi is marked by vibrant processions which are accompanied by folk songs, dances and a general sense of abandoned vitality. 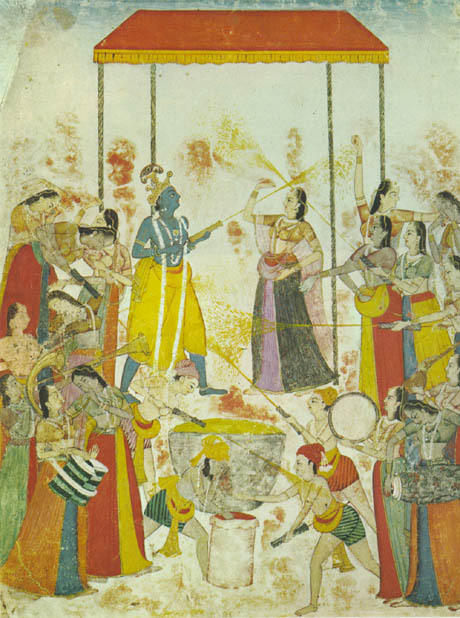 Today Holi is an excuse for Indians to shed inhibitions and caste differences for a day of spring fever and Big Fun. Teenagers spend the day flirting and misbehaving in the streets, adults extend the hand of peace, and everyone chases everyone else around, throwing brightly colored powder (gulal) and water over each other. The festival's preamble begins on the night of the full moon. Bonfires are lit on street corners to cleanse the air of evil spirits and bad vibes, and to symbolize the destruction of the wicked Holika, for whom the festival was named. The following morning, the streets fill with people running, shouting, giggling and splashing. Marijuana-based bhang and thandai add to the uninhibited atmosphere. Promptly at noon, the craziness comes to an end and everyone heads to either the river or the bathtub, then inside to relax the day away and partake of candies. In the afternoon an exhausted and contented silence falls over India. Although Holi is observed all over the north, it's celebrated with special joy and zest at Mathura, Vrindavan, Nandgaon, and Barsnar. These towns once housed the divine Krishna. Each area celebrates Holi differently; the Bhil tribesmen of western Madhya Pradesh, who've retained many of their pre-Hindu customs, celebrate holi in a unique way. In rural Maharashtra State, where the festival is known as Rangapanchami it is celebrated with dancing and singing. In the towns of Rajasthan — especially Jaisalmer — the music's great, and clouds of pink, green, and turquoise powder fill the air. The grounds of Jaisalmer's Mandir Palace are turned into chaos, with dances, folk songs, and colored-powder confusion. IndianaIndian.com is operated under IndianLoop.com network (Broadlink, LLC site) and is a Trademark of BroadLink, LLC. Any unauthorized use of these Trademarks is strictly prohibited.